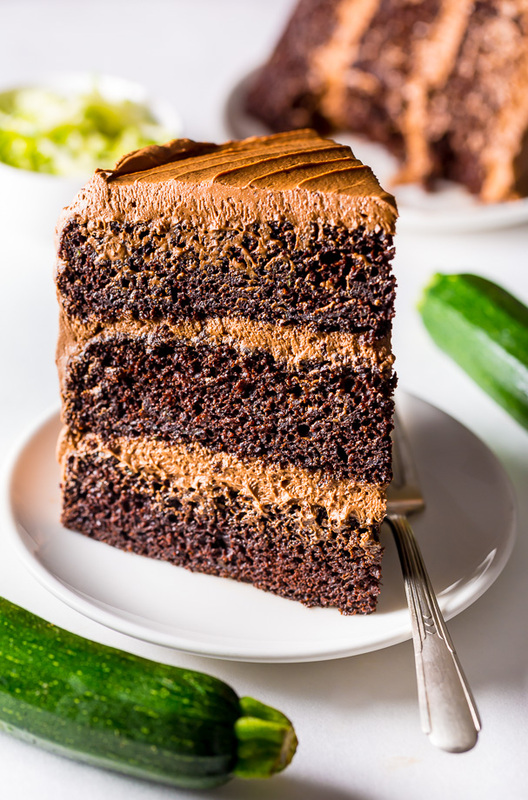 This Chocolate Zucchini Cake is moist, rich, and topped with fluffy chocolate frosting! One thing you and I have in common: we both LOVE chocolate cake. This recipe calls for 2 full cups of coarsely shredded zucchini. I use this box grater to shred it. You’re going to want to really pack the zucchini into the measuring cup, and don’t drain it! We want all that wonderful moisture. This recipe calls for vegetable oil, but you may use an equal amount of melted coconut oil in its place, if preferred. I do not recommend substituting oil with melted butter. For best results, make sure your eggs, egg yolks, sour cream, and milk have all come to room temperature before you begin baking. The cake layers should all be baked on the middle rack of your oven. If there’s not enough room in your oven to bake them all in an even row at once, you can bake them in two batches. For the rich chocolate frosting, you’ll want to make sure your butter is VERY soft before creaming it. The cakes should be completely cooled before adding the frosting. The assembly is a two part process: you’ll place one cake level on a large plate, top it with a thick layer of frosting, then add another cake level and repeat. Once you’ve added the final cake level you’ll want to leave the top bare and place the cake in the fridge to set for about 30 minutes. Once it’s set, you can finish frosting it, slice, and serve. 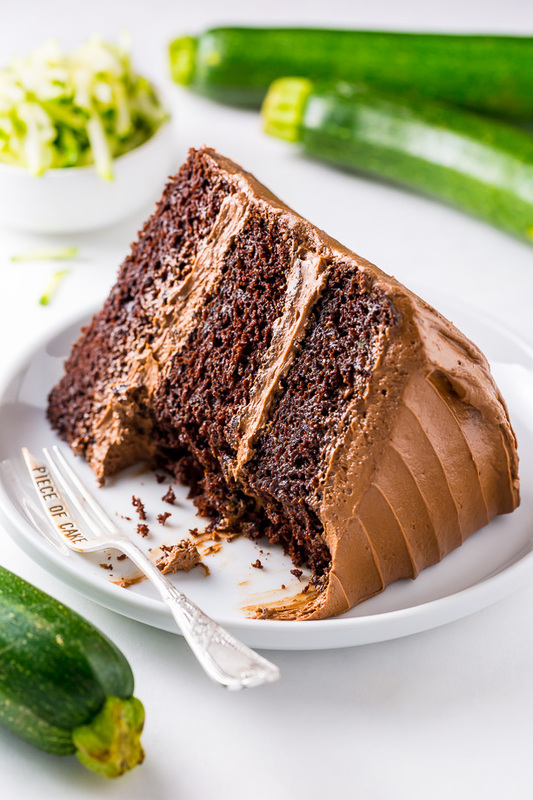 This EXTREMELY moist Chocolate Zucchini Cake is topped with fluffy Chocolate Frosting! 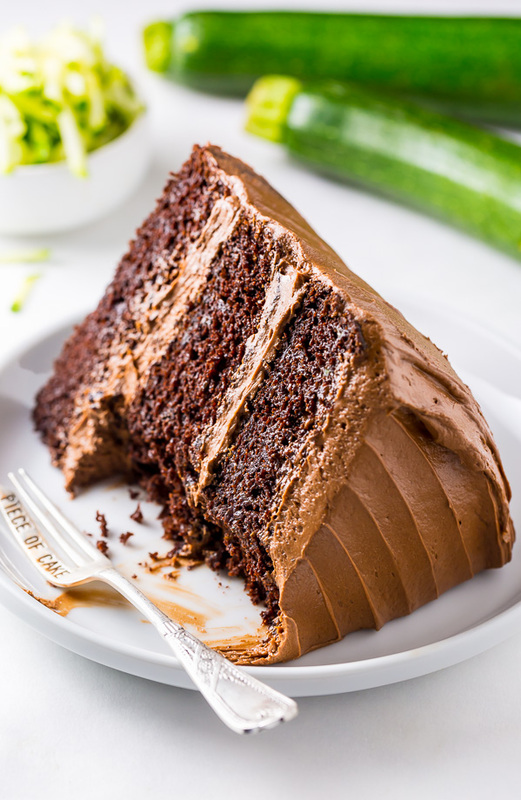 The perfect Summer chocolate cake. Preheat oven to 350°(F). Cut out three 9-inch round segments of parchment paper to line your cake pans with. Spray each pan generously - sides and bottom - with nonstick baking spray, then place the parchment paper cut out in the bottom of the pans and spray again. It's important to make sure every bit of pan and paper are sprayed so your cakes don't get stuck. Set pans aside. In the bowl of a stand mixer fitted with the paddle attachment, or in a large bowl using a handheld electric mixer, combine both sugars, flour, cocoa powder, baking soda, baking powder, salt. and cinnamon; mix on low speed until dry ingredients are thoroughly combined. Use your hands to break up any large clumps, if needed. In a separate bowl combine the eggs, egg yolks, zucchini, Greek yogurt, oil and vanilla extract; mix until completely combined. Pour mixture into the dry ingredients and beat on low until just incorporated. Pour in hot water and continue mixing until completely combined; about 1 minute. The batter will be thin. Divide batter evenly among prepared pans. Bake in preheated oven for 30 minutes, or until a wooden toothpick or cake tester inserted in the center of a cake comes out clean or with just a few moist crumbs attached. Cool cakes for 10 minutes in the pans before removing from pans and transferring to a cooling rack. Cool cakes completely before frosting. *If you don't have enough room to bake all 3 cakes on the same rack in an even line, bake 2 at a time. In a stand mixer fitted with the paddle attachment, or in a large bowl using a handheld electric beater, cream the softened butter on medium-speed until completely smooth; about 3 minutes. Turn the mixer off and sift the confectioners' sugar into the mixing bowl. Turn the mixer on the lowest speed and mix until the sugar has been absorbed by the butter; about 2 minutes. Increase mixer speed to medium; add in the melted chocolate, vanilla extract, salt, and heavy cream; beat for 2 minutes then increase the speed to medium-high and continue beating for another minute. If your frosting appears too thin, add a little more confectioners' sugar; If your frosting appears too thick, add additional heavy cream, 1 teaspoon at a time. Using a serrated knife, carefully trim the raised top of each cake, making each one an even, level surface. Transfer 1 layer to a large plate or cake stand. Spread a thick layer of frosting on top, then top with another cake layer, and repeat, thickly spreading it with a layer of frosting. Top with the final cake layer and place cake in the fridge to set for 30 minutes. Once set, finishing frosting the top and sides of the cake. Slice and serve, or keep refrigerated for about a week. I love the cake and this looks absolutely delicious! It would be interesting to try this summer…… yum!!!! That first shot is wonderful. Zucchini and chocolate actually go together great! That’s why chocolate chip zucchini bread is so popular 😉 Hope you enjoy it! I made this tonight just as the recipe says except I doubled the cinnamon (1 tsp instead of 1/2 tsp) and it’s an incredible cake. So moist and very rich chocolate flavor. I also sprinkled semi sweet chocolate chips over the batter in the pans before they went into the oven. This is such a great recipe. You can’t even taste the zucchini! Highly recommended!! What baking time would you recommend for a sheet cake instead of layering rounds? 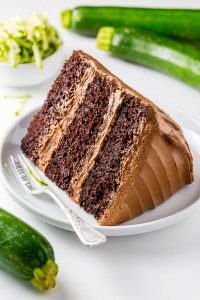 This is by far one of the best cakes I have ever had, thank you so much for this recipe, from the delicious chocolaty texture of the cake to the amazing creamy sweet frosting. wow, really impressive recipe! Love adding zucchini to this since I’ve made it in bread for years, great idea and nice baking tips too regarding room temp ingredients, thank you!